"Deceptive Site Ahead" warning informs about social engineering websites. 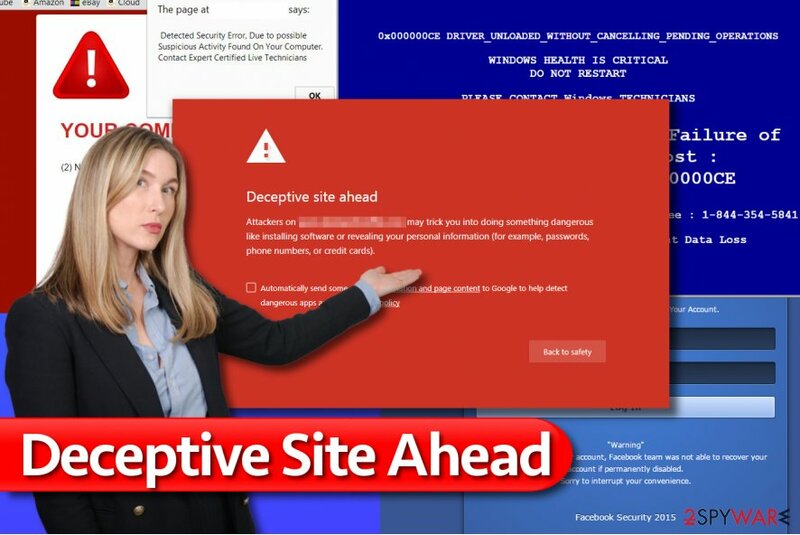 “Deceptive Site Ahead” is a pop-up window that can emerge when trying to open a random website while browsing the Internet. It warns the PC's user about a risk he or she takes when accessing the infected domain. 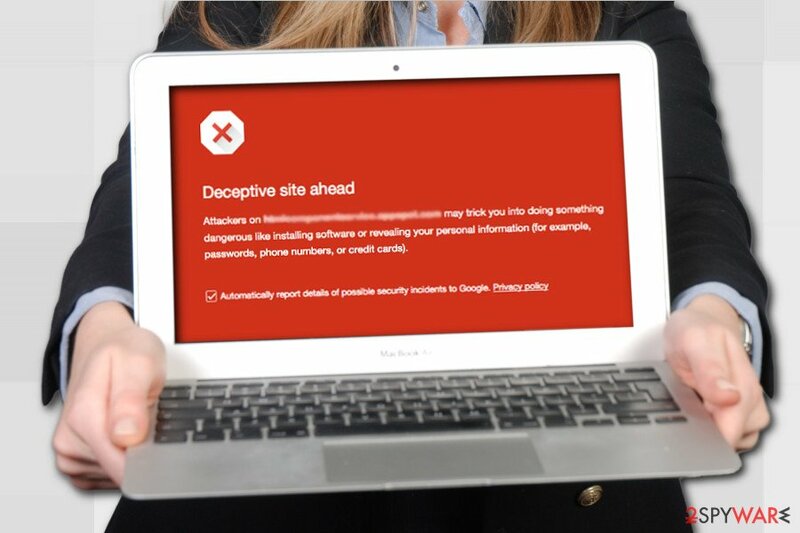 If you are currently witnessing the “Deceptive Site Ahead” pop-up alert, do not try to bypass it, otherwise you can put your privacy and security at risk by entering a phishing site or malware infected domain. “Deceptive Site Ahead” pop-up can be misused by hackers and turned to tech-support-scam alert. If it contains a telephone number, do not call for it as you can be tricked into downloading useless software or giving away your money to crooks for useless services. In case the pop-up you are seeing seems to be scam, download Reimage and run a scan with it to remove PUPs from your PC. Google Safe Browsing services have created this message in order to protect people from unsafe online content. This service scans websites and looks for deceptive buttons, for instance, download buttons that install software from unrelated and unreliable third-party sources. Deceptive website warning is basically designed to keep you away from web pages and content that can put your privacy at serious risk. After seeing Google Deceptive Site Ahead on Unanalytics.com and similar websites, you should not become worried about your computer’s safety. It’s not infected yet. This is merely a warning that it is better to keep away from the website you were attempting to visit. By clicking on the details and choosing to simply ignore the warning you can continue to the desired site, yet it is not recommended. In this case, you should install Reimage on your computer which will help you prevent potential malware and other dangerous programs. Users looking for ways how to get past Deceptive Site Ahead warning put their security and privacy at great risk because the alert does not appear without reason. Whatever the reason might be, it can compromise your computer or steal private information about you, and we are sure that you do not want that to happen. Of course, some legitimate sites may be flagged as well because of the advertising displayed on them, but such issue can be fixed with a little bit of effort. 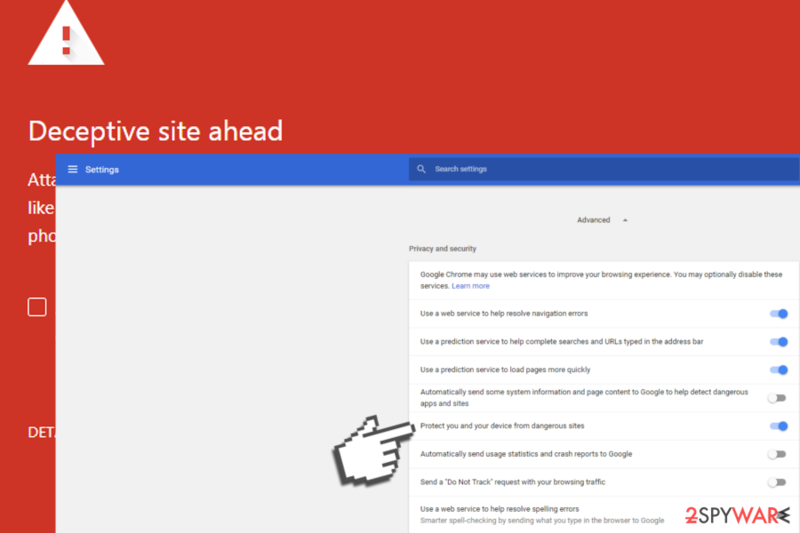 The webmaster of the flagged website has to visit a special Google support page which offers a guide explaining how fix the issue causing the warning to appear. Then, the potentially deceptive content of the site has to be indicated. It can be done via Google Webmaster Tools. The removal itself may take a while because the website administrators must find and terminate the sources of the potentially dangerous content. Only then, the site can be reviewed and evaluated by Google. Despite the lengthy procedure, the legitimate sites usually deal with this issue as their owners do not want to scare away the visitors. Therefore, usually, the sites which display “deceptive site ahead” instead of their site’s content should be avoided. IMPORTANT: crooks can take advantage of Deceptive Site Ahead warning and turn it to a Tech-Support-Scam. In other words, criminals camouflage a legitimate warning, except as they include a telephone number and urge gullible people to call for support. That's a catch that can lead to money loss or malware infection. If you randomly receive a Deceptive Site Ahead pop-up with a number of “certified technicians,” force close your web browser and scan your PC with Reimage to eliminate malware. 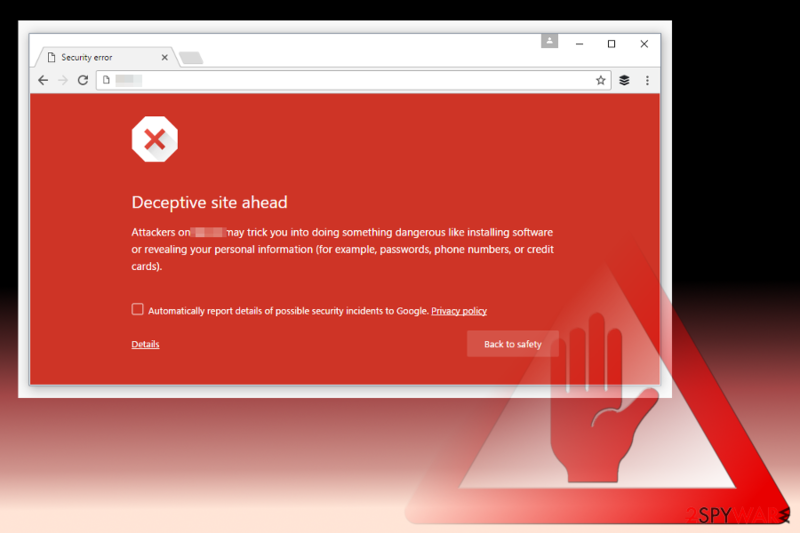 "Deceptive Site Ahead" is a warning from Google Chrome browser that prevents you from entering malicious, deceptive or phishing websites. Sites which contain deceptive download buttons. On 2-spyware.com, we have already discussed a number of such sites. Any of the browser hijacker websites can fall under the first category of websites that may act as a legitimate search engine, including Delta-homes.com, Yoursites123 and similar. The second category is usually associated with sites which spread adware and scareware-type programs, such as Intelli-support-assistant.com or Adsystemscan.com. Such highly unwanted sites and browser applications are also defined on other security-related sites such as Dieviren.de. Finally, the fake download buttons can be inserted into any random sites, especially, on obscure software download, file-sharing sites, etc. Nevertheless, sometimes the malicious website creators may bypass the Google filter and load regularly on your browser. In such case, you should keep your system equipped with a reputable anti-malware tool, such as Reimage. Click “Menu” or “More” icon in the upper-right corner. Select “Settings” and “Show advanced settings”. If you follow these instructions, your browser should not display such warning messages anymore. However, you will have to protect your computer from the cyber threats by some other means. We recommend obtaining a reliable antivirus and anti-malware protection system, which is capable of eliminating viruses from your computer as well as guarding you against these threats in real-time browsing. Take our advice and strengthen your computer's security with Reimage. 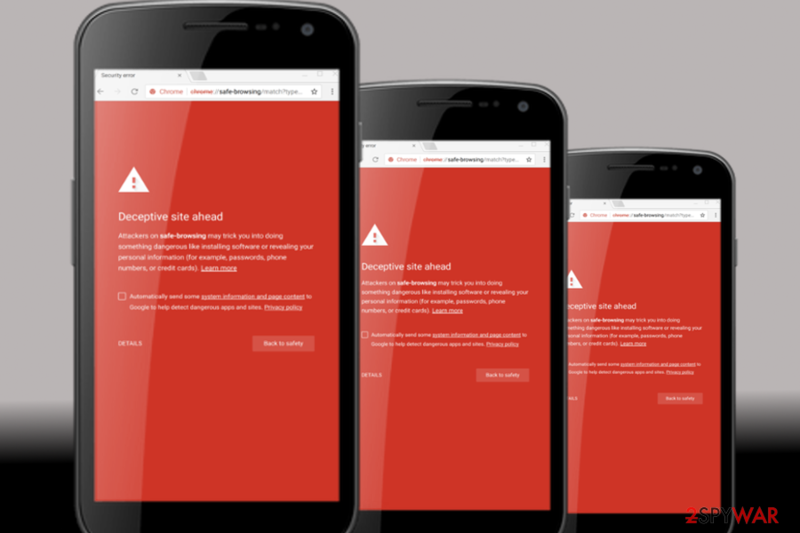 Although deceptive site ahead fix makes the described alerts disappear, we would like to remind you that Google Chrome browser displays them for your own good. Therefore, if you see the described message too frequently, ask yourself whether websites you are interested in are trustworthy. ^ What is Safe Browsing?. Google Safe Browsing. The official Google Developers website. ^ Lucas Ballard. No More Deceptive Download Buttons. Security Blog. The latest news and insights from Google on security and safety on the Internet. ^ Nate Lord. What is Social Engineering? Defining and Avoiding Common Social Engineering Threats. Digital Guardian. Data Loss Prevention Software. ^ Elie Bursztein. What Phishing Sites Look Like ? (Study). Elie. Elie Bursztein's webpage. ^ Social Engineering (Phishing and Deceptive Sites). Google Support. Search Console Help. This entry was posted on 2019-04-01 at 00:00 and is filed under System tools, Viruses. You can quickly scan the QR code with your mobile device and have Deceptive site ahead manual removal instructions right in your pocket. How did you remove Deceptive site ahead?